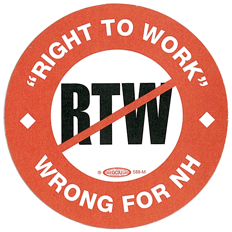 THE STATE OF New Hampshire narrowly defeated so-called “right-to-work” legislation Nov. 30 when the state House failed to override Democratic Gov. John Lynch’s veto. The vote was 240-139 — 12 short of the two-thirds majority needed. The override was expected to pass in the 24-member state Senate, but it never got that far. Republicans dominate the 400-member state House by almost three to one and the state Senate by 19-5. Right to work is a spin-doctor’s term for laws designed to weaken labor unions. Such statutes require unions to represent all eligible employees, whether or not they pay dues. Thus, some union resources must be spent on “free riders.” Studies show that workers in free-bargaining states make more than $5,000 annually than those in right-to-work states, have substantially better benefits, and experience far fewer deaths on the job (51 percent less). Since Republicans swept into power in many states governments last November, anti-union legislation has increased dramatically. Unions and their members have responded vigorously across the nation to defend their rights. There are currently 22 states with right-to-work laws. Fourteen others are considering such statutes.